U.S. manufacturer of a do-it-yourself sprinkler system LawnbeltUSA announced a new lawn watering kit that installs just below the turf line. The company reports that their new kit will allow homeowners to save over 30% on their water usage. ... water usage can be reduced by up to nearly one-third of current levels when conventional sprays are replaced with Stream Rotator Sprinklers. 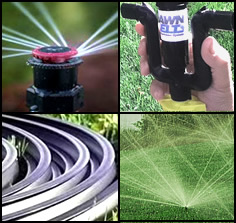 LawnbeltUSA Inc. announces a new watering kit has been added to their do-it-yourself (DIY) sprinkler system store. Lawnbelt is an in-ground watering system that allows homeowners to install a sprinkler system just inches below the turf without digging trenches. The sprinkler conduit is manufactured here in the U.S. and can be combined with any 1/2" sprinkler head. The system also attaches to an existing outdoor faucet and requires no plumbing experience to install. The lawn sprinkler company just today added a unique sprinkler head called a Rotator to its product line. The new sprayer attaches to a Lawnbelt proprietary part called U Fitting (shaped like a U with an auto drain underneath to allow water to escape when the sprinkler is turned off). President Larry Burke explains, "This unique design allows the system to automatically drain after each watering cycle so that it requires no weatherization. The new sprinkler head and body simply screw onto the fitting"
This new sprinkler head delivers maximum coverage even when water pressure is low. The multi-rotating sprinkler head throws multiple streams of water at a distance reaching over 25 feet. The Rotator System not only runs at low pressure and low volume but it also saves water, the company says. Larry Burke, President of LawnbeltUSA remarks, "in our testing it has shown that water usage can be reduced by up to nearly one-third of current levels when conventional sprays are replaced with Stream Rotator Sprinklers. This kit comes at no better time as many homeowners are facing water restrictions at higher utility rates." The sprinkler company reports that three types of rotator heads are now being offered depending on the size of the lawn to be watered. The new heads offer uniform sprays and come in adjustable angles by twisting the nozzle. Since 1999, Lawn Belt has been providing homeowners with an alternative to conventional PVC Sprinkler Systems. LawnbeltUSA is located in McCall, Idaho USA and is open for tech support and sales questions between 8-5 M-F MST. For more information and video demonstrations, please visit their website at http://www.lawnbeltusa.com or call them at (877) 529-6235.